I don’t know about you guys but I tire of my home décor and furniture easily. I try to be content with what I have and make it work but sometimes you just need a change. I’ve lived with our current living room furniture for 11 years and 4 houses! I can at least say I bought good quality furniture. Now that I am home daily on maternity leave I sure have been dreaming a lot about exactly what I want. I’d like to take advantage of the long days away from work and use some of this time to shop and hopefully purchase a new sofa and chair for the space. I have been “pinning” away on Pinterest, take a look at my Living Room board. Pinterest is a great resource for ideas and a great way to group together my thoughts on what I like. Buying a new sofa feels like such a commitment, I mean 11 years have passed since the last time I bought furniture for the living room! I also like to create mood boards when planning a space, it really helps to visually see all the ideas floating around come together. I also think this is a great picture to show design associates when shopping the furniture stores, it always helps them to know your vision. Here is a general idea of what I am going for. Lighter and brighter but still traditional. I love adding pieces that have a cottage feel as accents, you can’t see here but in reality I’d add pops of color that give that vibe. To break this down a bit, I have the rug and the coffee table already. I have two side chairs that are in need of re-upholstering, I’d like to cover those in a solid neutral color fabric and white wash the wood on them for a similar look to these on the board. I would love a comfy leather chair with an ottoman in a light colored leather but most dramatically I want a new neutral colored sofa. So, let’s talk about the sofa, the big guy in the room. I really want a white/light sofa but everyone including my husband thinks I am crazy. Mainly because we just had our first child and people think I don’t know that children make messes, my child will make messes and I am sure I will panic the first time soda or peanut butter and jelly even make it in the living room by tiny hands. So with that, my second option would be a grey/blue colored fabric. But….I want to talk about the white sofa. I think it is do able. The thing that concerns me the most is our dog, she currently loves to lay on the couch and in the chair and a half. She has probably worn the fabric the most and she is a chocolate lab so dark hair on a white couch would probably drive me insane. That makes me hesitate. For fun let’s take a look at some research on a white sofa anyway. First let me explain why I want a light sofa, currently my living room is so colorful. I have loved that, but now I would rather add color with pillows, throws, & accessories so that I can change them with the seasons. It’s hard to find these items to match my current furniture. Also I love the soft colors in my dining room, I have been pretty happy with the color choices in that room since day one. This space is adjacent to the living room so it would be nice to quite the living space with a more neutral pallet to match the dining space better. I love Ikea’s Ektorp Sofa. It looks pretty close to Pottery Barn’s Comfort Sofa and Ikea’s version is only $400 bucks! I love the fact that you can wash the slip covers and not worry about staining. On looks alone the one thing I don’t like is the skirt, I really would like a couch without the skirt. Here are some great blog post from a few folks that own the Ikea Ektorp sofa and I love what they have to say about it. Liz Marie wrote about her experience with the Ektorp sofa and gives an honest review. She does a great job explaining the pros and cons. I will admit after reading here that the sofa is a bit on the smaller size concerns me. Here Kelly at A View Along the Way talks about here Ektorp sofa and how well it works for her and her young family. She also talks about how easy is to clean and replace the slip covers if needed. And Melaine at Sweet Savannah gives a great review of both the Ikea and Pottery Barn versions. You cannot tell the difference in the two! Even after reading these great reviews I am still on the fence. One, do I really want to go white?!? Two, is this couch comfortable enough for us? Three, will the smaller size bother me? I think the only way I could be certain is to make the drive to Ikea and try it out and see it in person. $400 is a heck of a deal and I think I could live with it for a few years but I’d like to see it and also sofa shop a bit to look at what else is out there, specifically in a darker fabrics. Also I plan to price out having my current sofa re-upholstered. It has held up remarkably well so I know it is good quality. 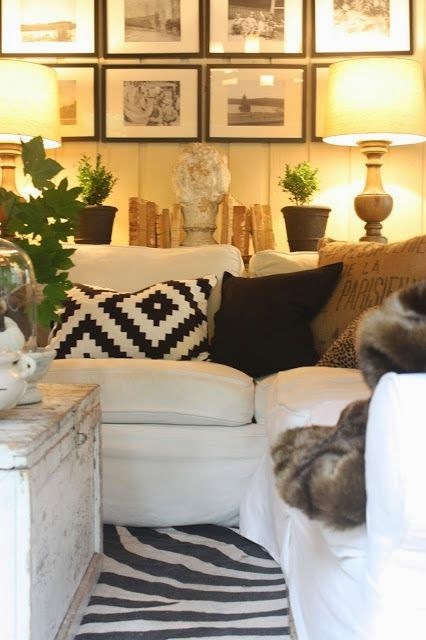 Just yesterday Kate at Censational Girl did a great post on considerations when buying a sofa. It was perfect timing and a good read. I will certainly be using her tips and if you are in the market for a new sofa, click HERE to read the post. Hopefully soon I’ll have a post on my NEW living room furniture. I will keep you updated on my hunting and decisions. If you would like to see my Polyvore Mood Boards Follow me HERE. If you would like to see my Living Room board on Pinterest Follow along HERE. I’d love for you to follow along! What a Mind blowing Living room Furniture!!! .Thank you for sharing this blog with us. Recent i have planned to buy a bedroom furniture from Fabfurnitureco online store. and but i will buy these Living room furniture for my next!! Wow nice design of furniture. I am very grateful to read your blog and looks your images on room furniture. so I like your blog as well as sharing your topic with our groups.